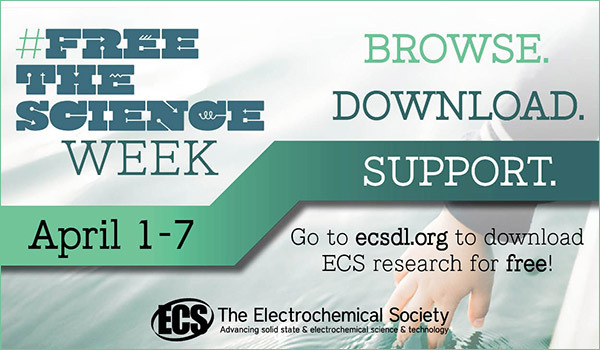 The Electrochemical Society (ECS) will celebrate its third annual Free the Science Week (April 1-7, 2019) by once again taking down the paywall to its entire online collection of published research. For the duration of the week, the ECS Digital Library, which contains over 151,000 scientific articles and abstracts, will be freely accessible to everyone. Since its launch in 2016, ECS Plus has flourished into a widespread movement. At its forefront are leading, forward-thinking institutions that recognize the value of incentivizing open access publishing on an individual, institutional, and global scale. ECS Plus offers institutions a competitively priced subscription package that grants access to all of the content in the ECS Digital Library, including our top-ranking, authoritative, peer-reviewed journal content, as well as free and unlimited open access publishing for affiliated authors. Immediately following its January 2016 launch, ECS Plus acquired the National Science and Technology Library of China—a consortium then consisting of just under 800 institutions—as a subscriber. 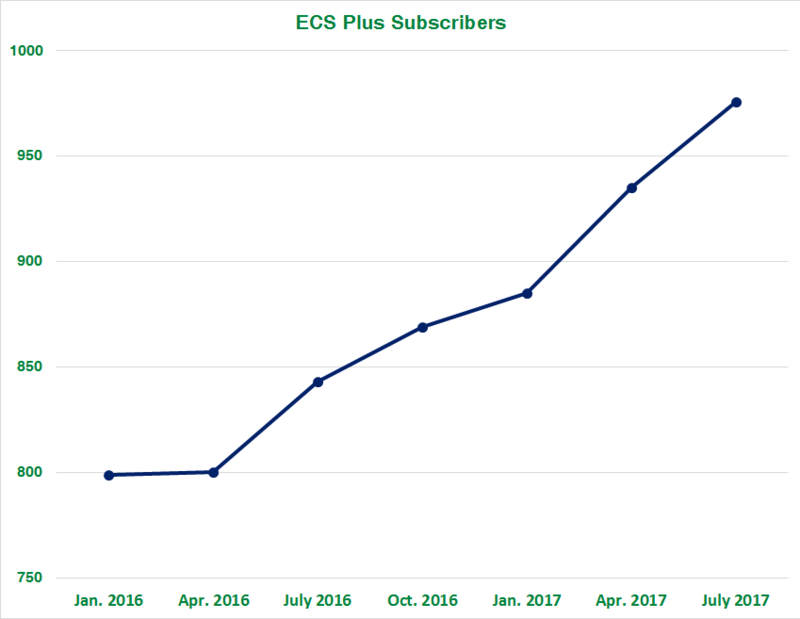 Over the subsequent months, ECS Plus saw a steady rise in subscriber count, reflecting a desire shared among institutions worldwide to make open access publishing a viable option for authors. If data trends serve as any indication, this desire holds fast. In recent months, ECS Plus gained two new subscribers: Arizona State University and the University of Michigan. Just last month, the National Science and Technology Library of China increased its ECS Plus subscriber count from 907 to 924. The University of South Carolina recently confirmed an ECS Plus subscription for 2018. Help Us Spread the Word About ECS Plus and Our Open Access Offers! Please let your librarians know that our subscription prices for 2017 are up on our website. The Digital Library has not increased in price since 2013! ECS members continue to be eligible for one OA Article Credit per year. If you would like your institution to subscribe to ECS Plus (which allows authors affiliated with a subscribing institution unlimited article credits for publishing OA), please let your librarian know that you would value it. In 2015 ECS published just over 700 Open Access papers. This was fantastic news for ECS’s mission to Free the Science, and even better news for our authors as 96% of those papers were published as OA at no charge. Why were we giving away so many article credits? When ECS first launched our Author Choice Open Access program in February 2014, we wanted to explore the feasibility – both financially and practically – of supporting OA as far as we could in our publications. It quickly became obvious how eager our community was to assist in ECS’s commitment to disseminate our research as widely as possible. In another commitment to our libraries, though, we had promised not to increase subscription prices, and have stuck by that commitment since 2013. Moving into 2016, we wanted to continue to offer Article Credits to as many authors as possible, but also needed to ensure that our publications are self-sustaining. In order to accomplish this, we launched a new product called: ECS Plus. This offers libraries a subscription to all of our content PLUS unlimited Article Credits for authors affiliated with their institutions. Our new product, ECS Plus, is exceptionally competitively priced and includes a complete subscription to ECS’s Digital Library, as well as unlimited article credits for affiliated authors. Please encourage your librarians if this is something that you or your colleagues value! ECS Members receive 1 free article credit per year – if you’re not yet a member, it might be time to consider joining us. Find out about becoming an ECS member, and other benefits of joining, by checking out our new membership page! Once an ECS Member’s article credit has been used, any subsequent OA publications receive a 75% discount – that’s $600 off our already low APCs. If you have any questions about changes to our Author Choice Open Access program, you can find out more on our information pages about OA, ECS Plus, and on our subscription information pages – or you can get in touch with us directly at oa@electrochem.org. ECS’s goal is to make Open Access publishing free for all our authors. To help make this a reality please give to the Free the Science Fund.